Moving, acting, working, proceeding, etc., with ease, sometimes with superficiality. Easily done, performed, used, etc. Affable, agreeable, or complaisant; easily influence. Today I am presenting you with some options to make Twitter more manageable. Hopefully after reading about how to use and understand Twitter and some of the etiquette rules and tips to get involved you feel like you’re getting a handle on how to use it as a part of your PLN. But Twitter can still be overwhelming and complicated. Here are some tips on making Twitter easier. In order to get a quick glimpse of what’s being tweeted about, check out hashtags or search for keywords that are important to you. 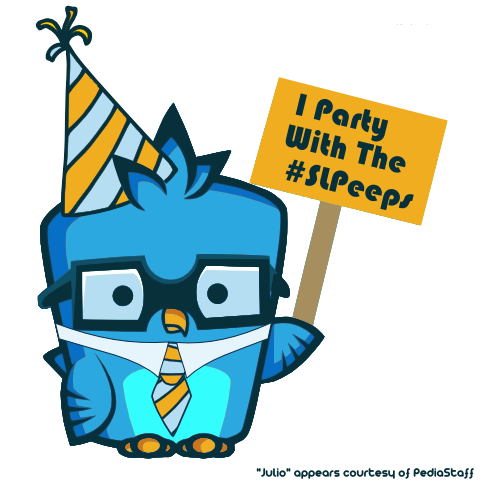 Some hashtags to consider following are #SLPeeps, #Audiology, #hearingloss, #slpchat, #speechtherapy. In order to find these hashtags on Twitter web, simply put the hashtag (with the # sign at the beginning) into the ‘search’ box and click search. In order to regularly see tweets with this tag in them, click “save search”. Better yet, though, ditch Twitter web and get a Twitter client that will provide a way for you to see constant updates from these searches without having to go back to ‘saved searches’ all the time (see below). A Twitter client is anything you may use to access Twitter indirectly, instead of with Twitter.com, which has developed a reputation as less user friendly for various reasons. There are many good clients out there like Tweetdeck, Hootsuite, Twitter for iPhone/Pad, Ubersocial, Tweetie (for Mac and iPhone) etc. I use Tweetdeck on my laptop, Mac and iPod Touch (throwing a random shoutout to @chelseannbass cuz I didn’t say iTouch). For a brief review of some popular Twitter clients click here. Also, since that review was written, a Canadian platform called Hootsuite has become VERY popular and I would posit that it has become one of the top 5 Twitter clients available today. It does more or less everything Tweetdeck does, except that it happens to be blocked at my place of work so I don’t use it. *UPDATE: I still can’t use Hootsuite at work, but it’s the only way I use Twitter on my iPad. I feel Hootsuite is, hands down, the best twitter client for iPad right now. I didn’t have an iPad when I first posted this, though. I still use Tweetdeck on my Mac and laptop. But since Tweetdeck and Hootsuite are so similar, it’s a seamless transition for me between iPad and others devices. I like Tweetdeck because I can create several columns that I can see simultaneously and that have different uses (e.g. my mentions, my DMs, new followers, and various lists I’ve created). I find it much easier to keep up with the different columns because it means I can take my time and browse things if I have time but I can stick to the basics and what I’m most interested in if I don’t have time. For instance, if I don’t have a lot of time I check my mentions, DMs, #SLPeeps tagged tweets and my list of SLPs that I follow. If I have more time I might look more closely at what teachers and audiologists I follow are tweeting as well as others I follow for various interests/reasons. This is how I’m able to follow so many people without getting too overwhelmed, although it’s always smart to go through and cull the herd every now and again. In order to add specific columns in Tweetdeck (and other platforms like Hootsuite) I click to add the column (in Tweetdeck it’s a giant + sign at the top left) and then it asks me what I want in my column. I can choose from “Core” items (mentions, DMs, favorites, all friends, etc. 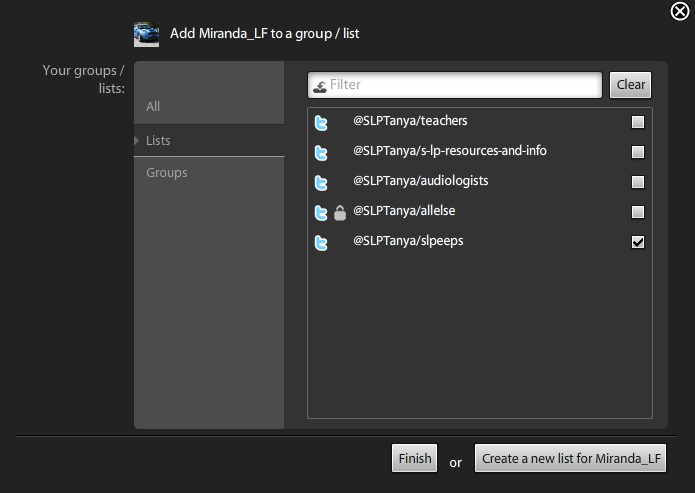 ), a ‘search’ of a specific keyword or hashtag such as #SLPeeps, #slpchat, #audiology, or one of my Groups/List (see below) such as the SLPs, audiologists or teachers that I follow. Another thing many Twitter clients offer is the ability to set up tweets to be sent out automatically at a future date and time. This can be handy if you’ve stumbled upon multiple things worth sharing at the same time and want to spread out your tweets a bit. It’s also helpful if you want regular tweets to go out interspersed, like we do for #slpchat leading up to any given chat. Some Twitter clients automatically shorten URLs for you so they don’t take up as much space in your tweet. Also, with several, you can drag and drop media such as pictures, video, etc. directly into your compose tweet box and it will automatically upload the media to twitpic or some other place for that and add a shortened URL to your media in your tweet. Clients also allow you to do RTs in the classic way as well as the new way. Classic RTs allowed you to add comments to your RTs before tweeting it to all your followers, whereas the “new RT” doesn’t allow for this. It does, however, make it easier to RT a tweet that is long and you CAN cut and paste that person’s tweet if you wanted to but that’s cumbersome. Personally, however, I prefer to be able to add comments to my RTs, which Tweetdeck (and various other clients) allows you to do. Twitter Client allow you to do a host of other things beyond Twitter Web but the tips above are the ones I think are best for time savers and ease of use. If you have other clients you really like or functions you find indispensable, please share them in the comments section below! Ignore whole lists of people you follow for periods of time at the expense of focusing on the people you find most interesting/rewarding to follow. Twitter can get very overwhelming if you feel you have to read everyone’s tweets all the time. It has even been recommended that people tweet important tweets several times a day, since it is assumed that not everyone is reading your tweets at all times. Feel free to return that favour and save yourself some anguish. Creating lists helps you to streamline your Twitter feed by topic or preferred people to follow. This means you can follow LOTS of people, but don’t have to read every tweet they all post, depending on how much time you may have from one day to the next. I have several lists but my most important one, SLPeeps, is my list of SLPs and related that tend to tweet about the profession regularly or that I more regularly interact with. Tip: You can follow someone else’s list by looking at their lists in Twitter Web and clicking “follow this list”. 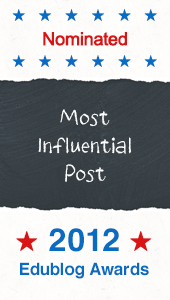 CASLPA and ASHA have lists that may be worth following for SLPs and AUDs. You can create lists many ways and it’s different in each Twitter client (see below) but in the Web version you click “lists” from your home screen and then click “create list”. A list can be public or private. Now you’re ready to name your list and then add people. You can add people by going down your “Following” list and clicking the list box (next to the word “following”) to add them to whichever list (or multiple lists) you choose. Tip: If you don’t want to follow someone else’s list in its entirety, you can look at their lists, click on “following” to see the list of people the list is follwoing and then click “follow” and/or “add to list” in Twitter Web to add people from their list to your own list(s). Note: You can add people to a list and see their tweets without following them (unless their tweets are protected). Many Twitter clients have ways of doing this as well. 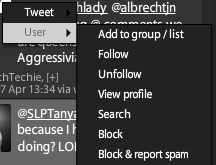 For instance, Tweetdeck allows you to create lists and add people to lists by clicking “user – add to list” in the person’s little picture (and it’s a real picture, not an egg, right?). If you haven’t yet created an appropriate list for that person, you have the option to create a list for that person. You can also click the little plus symbol next to the user’s name (see it next to SpeechTechie’s name in the picture above?) to do the same thing. What other tips do you have for making Tweeting more efficient and manageable? Also see my post on Balancing Life with Social Media for more tips. ← I’ve created a LinkedIn profile…. Now what? Haha! YES! I was going to comment on that before I even read the next line! Perfect. Side note, I used Tweetdeck for a long time until I starting having battery life issues. I’ve been using Twitter for Mac and it’s okay. Very simplistic, but gets the job done. I still use TD on my iPhone. Hootsuite is a wonderful program. It’s ideal for folks who want a quick and easy way to schedule their tweets in advance. I use it across platforms (laptop, desktop, iPad, Droid) and so can access the system pretty much 24/7. Thanks so much for the comment! I think I’d love Hootsuite (it’s built to be almost exactly like Tweetdeck) except it’s blocked at work 😦 I’ve heard it’s the best platform for iPad – bar none. So helpful! Thank you Tanya!